My pal Rob and I recently had a short, early morning session fishing a local tide race. Not a sniff! The following day Rob sent an email to say that him and his dad had fished a local rock mark that evening - here's the outcome. Any luck with the carp? Me and dad decided to have a crack tonight off the rocks. This morning's blank didn't fill me with confidence but I figured the conditions would be perfect so what the heck! We got there about half-five and it looked perfect, Nice and flat with just a little swell and next to no wind. I tried a few likely spots with the fly (keen for my first fly caught fish of the year) and dad was plugging away in hope of a bass. After 45 biteless minutes I was starting to fear the worst! I tried the weedless lure (left on from this mornings fishing) along the drop off to the right but the swell made it impossible to fish correctly so I switched to a small Dexter wedge in hope of a pollack. A change of position brought a decent knock about halfway back on the retrieve (encouraging). The next cast and a double pull had a nice pollack on The line - around a pound. 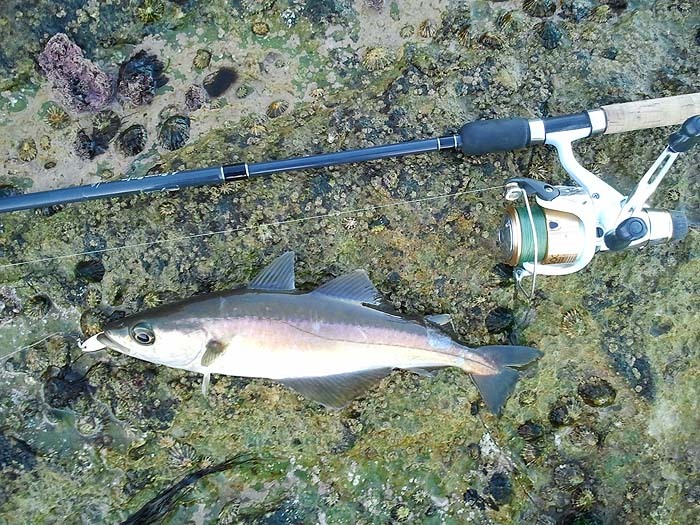 The tide had started to flood and the fish were biting, dad had a tiny pollack on a wedge and I was getting almost a bite a cast although I missed a few and lost a better fish (turns out the treble was missing two points). I landed 12 on the wedge and lost one or two more. I pointed out some jumping fish to dad and once he moved to cast at them he picked up a few more fish (7 in total) plus he lost a nice fish (2.5-3 lb) at his feet. 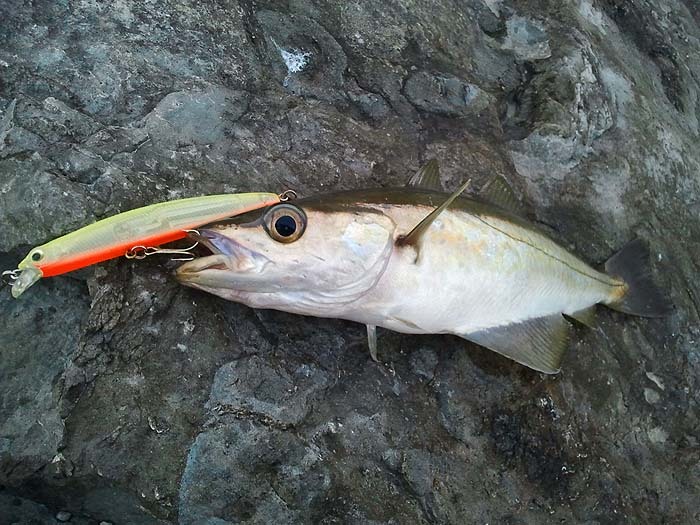 I changed to a 'Kiss plug in hopes of a bass and it got hit on the first cast, another pollack, although slightly bigger than the wedge-caught fish. I had another 2 on the plug before the bites dried up. It was nice to finally end my run of blanks with a few fish! Now to decided where to fish on the weekend? A nice way to end the day! I've often noticed that pollack bite particularly well at dusk although I have caught lots of them at first light too. It's one of those things that needs a concerted effort to fish the same spot on successive mornings and evenings for several days to establish the facts. Hard going but has anyone done it?